Ok, so on to Purse Week. . . I really should have posted about this sooner but I spent pretty much all my free time this week working on my entry. I came across the contest and A Lemon Squeezy Home late Sunday night so I knew I wouldn't have a whole lot of time to come up with something. Crazy me, I decided to whip up a pattern from scratch and it was a learning experience for sure! I've been playing around with the idea of creating a purse pattern for my shop and this was sort of a trial version. Still lots more work to be done but I'm happy with what I ended up with. Anywho, if you are just now finding out about Purse Week, make sure to head over to A Lemon Squeezy Home for lots of purse inspired tutorials. 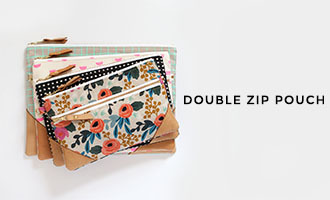 Also, if you've sewn a purse, tote, or clutch since July 1st of this year, you can enter it! You have til midnight (MST) tonight :) To see all of the fabulous entries, head over to the Flickr pool here. Oh, I love it!!! I entered Purse Week too, but not with anything this darn cute! I hope you do sell this pattern. I would love to make one for myself! Love this bag. I'll test the pattern for you. This is a very cool clutch!! I love all the detail, fabric selection and lining!!! gorgeous fabric and i love the shape!! Love everything about this! I am on the list with Mary for PREORDER! Oh! gosh... that is soooo cute. I love it! For those interested in the pattern, I hope to have it ready in the next month or so. Maybe even sooner. . . I just want to make sure I have all the kinks worked out! I love the fabrics, and all the little details...the side bands, the top stitching. So pretty. And I am a sucker for a wooden button! Great job, Vanessa! You brought it, girl! Cute! great job Vanessa. love all the details. Had fun looking at the other entries too. The clutch looks great! The lining is the perfect color. All of the detail is kind of mindbending; what patience you have! Oh I think that's lovely! It looks detailed, fancy, but the construction also looks sturdy and not totally complicated. PERFECT! Good luck! What a seriously pretty clutch. The construction is beautiful and the fabric is such a great choice. Found you over at Purse Week!! LOVE this! I love the colors!! Great Job!! This clutch is so awesome. SO awesome. Love your fabric choices! 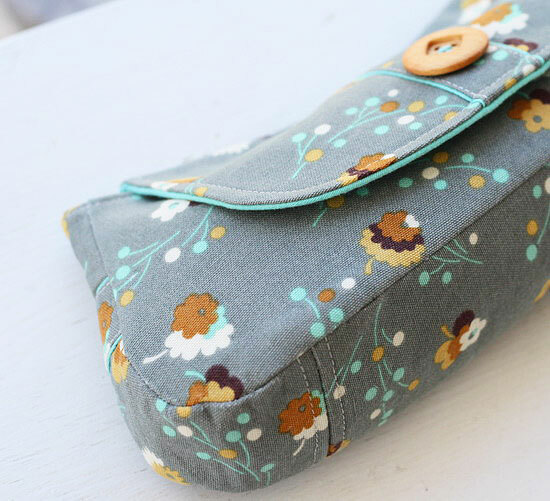 I love, love, love you grey clutch and voted for it over at Lemon Squeezy Home. I actually found your blog from there to Flickr to here. I cannot wait for the pattern, so excited! Absolutely beautiful! Everything "works" on this purse. The fabric, lining and button look like they were made for each other. Top shelf stitching too I might add. well done. Wow! 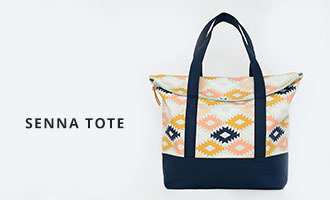 You are doing a grate job on the Purse Week I love the purse, design, and the material Thanks Its fascinating. 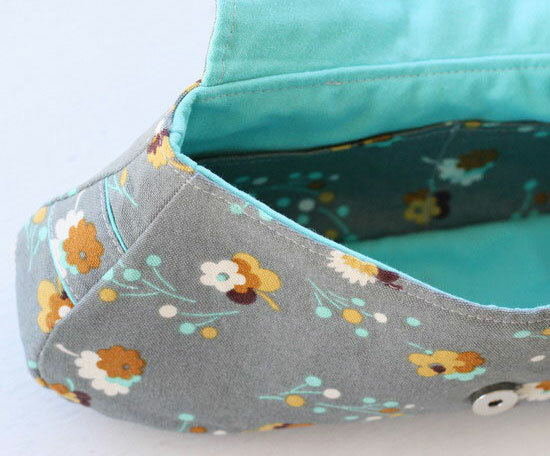 did you ever publish the pattern for this clutch? There is not another one on the market like it that I have found. I would love to be able to make one for my daughter who at 16 is just now becoming interested in wearing dresses again. This is very understated and classy! Hey Kelley....unfortunately, I don't have a pattern at the moment for that bag. Sorry! 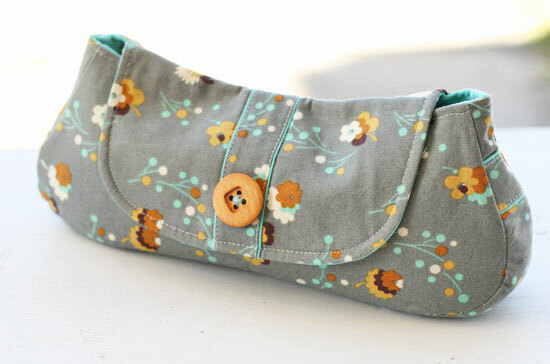 Do you have a pattern for this wonderful clutch yet? Hi! No, I never did get around to making a pattern. Life kept getting in the way and then I forgot about it completely! Hi, I know you wrote this post forever ago, but I was wondering if you remember what fabric you used for this. It's beautiful! Thanks! Hey Tracie! It's by Denise Schmidt and I think it was part of the Flea Market Fancy line? ?